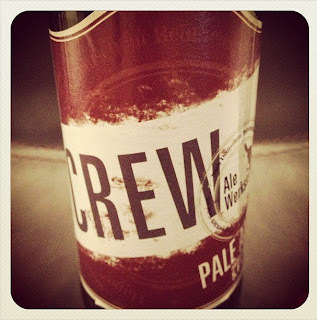 The Genuine Beer Blog: Crew Pale Ale !!! Hey Everyone, Apologies for no posting in the last couple of day's its been mad busy, but were back. Tonight's review is from the Crew Alewerkstatt, Hope you all enjoy !!! Slight Bitter, Hops, Refreshing, Smooth, Light. 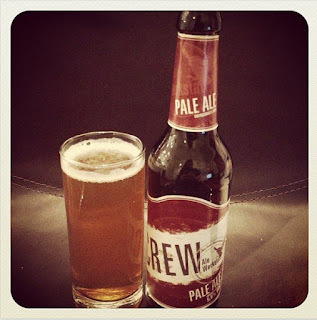 Crew Pale Ale is a smooth, light, refreshing beer with slight hops flavours. There is a slight bitterness to this beer, however this is balanced out with a slight sweetness, making this an easy drinking beer. This beer isn't as strong as other pale ales out there, the hops flavour isn't as prominent in this beer as in others, which is a shame as I really like a stronger hops flavour to a beer, therefore this beer is slightly lacking there. Crew Pale Ale has a medium carbonation, giving it that nice coating on the tongue and refreshing quality. There is also a slight cloudiness to this beer. There is also a slight citrus flavour to this beer, coming from the hops used in the beer. Overall Crew Pale Ale wasn't what I was expecting, especially after trying and reviewing the Crew IPA which is really fantastic, don't get me wrong this is a nice beer, easy drinking and nice flavoured, it just didn't pack as much of a punch as I was hoping for in a Pale Ale. This is a pleasant beer, one that you could drink many of, however it just doesn't stand out for me, but I would recommend people give it a try and I would buy it again.